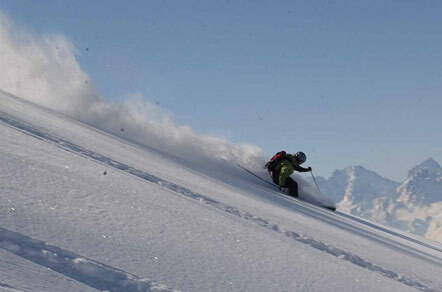 Skiing the local delicacy – a tale of backcountry powder in Switzerland’s Verbier. People are rummaging through the stacks of skis and poles for today’s gear. Slalom skis are ignored. Today it’s the fatties that are coming out to play. Last night was the first snowfall for over two weeks; 35cm of Switzerland’s finest powder. I jump out of my sleeping bag, where I spent a night in the utility room - the only spare space my friends had for me to crash. Swinging my feet onto the cold tiles, I throw on my thermals, still damp from yesterday’s endeavours. The roads are covered in snow. Snowploughs have been working through the night to clear the village; the sides of the street are lined with tall walls of snow. Cars clatter past, the jangle of chains from every passing vehicle. Drivers peer through steamed up windshields, roofs piled high with snow. Every so often a quad shoots by, making easy work of the slush. It’s a cold form of transport, just four wheels, a seat and a ski rack on the back, nevertheless, it is both economic and fun. By the time we reach the gondola station, the queues have already built up. To the sides, ski school groups chatter excitedly. The concourse is slippery, fresh snow continues to flutter down, hiding the icy patches. The gondola is packed, rammed to the rafters with people waiting to get the first fresh tracks. There is an eerie silence among the 30 people I am squashed in with. Everyone has a distant smile on their face. Those at the windows bang snow from the sides of the gondola, looking down, peering through the cloud, in near white out conditions, to catch the occasional glimpse of another skier sweeping through the mist. At the top of the gondola, everyone pours out, manners forgotten. Women and children are pushed to the side as people dash, desperate to make their mark. Powder days don’t allow for chivalry. The weather at the top is cold. Yesterday’s wind has disappeared, but had obviously blown overnight during the snowfall, as there are stashes everywhere and snow is piled up around the gondola station, behind signs and in the gullies. Up here we are above the cloud; the sky is clear and blue. Rainbows are everywhere as airborne flecks of snow catch the sunlight. The cloud remains in the valleys; dramatic peaks rising out from the whiteness. Still on autopilot we clip into our skis, flip goggles down, and double-check the kit we have in our backpacks. The first person to head for the ridge stops after 50 yards, setting up a transceiver check. One by one we ski past, confirming that the transceivers are giving out a signal. It’s days like this when the risk of an avalanche is at its highest. No snow for a while, plenty of sun and then wind during the fresh fall. The snow has not had time to consolidate, creating prime slide conditions. Every precaution has to be taken. We traverse along the ridgeline, avoiding the well-worn tracks that had been skied out last week. On this rocky section, the snow hides the rocks from view, but not from skis. There has already been plenty of traffic along here, so the path is easy to follow. Every so often, we see an untracked line dropping off to the right, but we keep going. Eventually, we start creating our own traverse line, poling across the flats. Finally, we get to where we want to be. Those at the back of the group are abandoned as everybody dives for the line they fancy. The weather has been kind. The snow is light and the wind has created pockets of deep snow. The first turns are effortless. 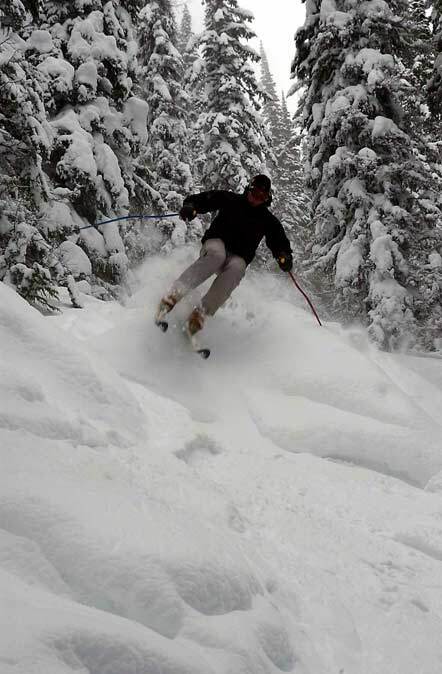 As I cruise though the crystals, powder spurts from my skis into my face. The pitch is steep, but not too steep, about 30 degrees. Fast enough to let your skis run loose. No need to put in tight turns. Go with the mountain, turn when you feel like it. Search out the best line, find a rock and drop it. Aim for the banks, the gullies. Turn off the tops, the terrain is a playground. Nearing the bottom of the first pitch, we drop into the band of cloud that we saw from above. The blue skies are starting to disappear. Visibility is getting bad. Just when my legs are getting tired, we drop into a tighter section. Still wide enough to turn happily, but the remnants of moguls exist under the new snow, making the going tough. We are well and truly out of bounds by now. Out of the area looked after by ski patrol and into the wilderness. Safety and fun are the two conflicting requirements of the day. We take a high traverse line across the first pitch. This slope is wind loaded from being in the lee of the wind. At 40 degrees but open, it would be a huge amount of fun. The wind loading will ensure the snow is deep. Yet these slopes are the most dangerous. We dig an avalanche test pit, but sadly, it shows what we had thought - the slope is not stable. We traverse on round to another aspect. Underfoot, this pitch feels much firmer. It’s not far now, and we can see the tree line we’re heading for. 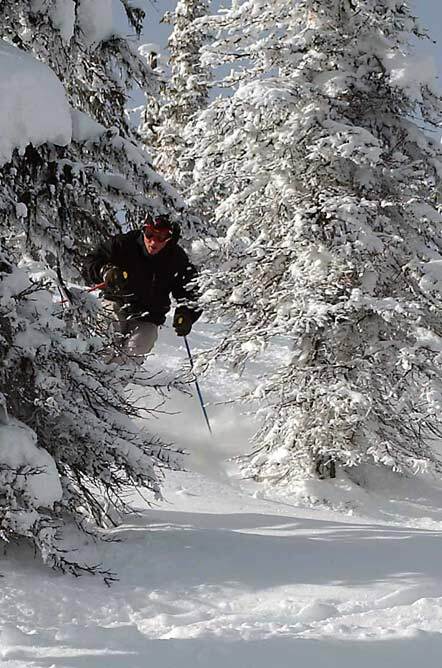 Once in the trees, the skiing changes. Gone are the tentative turns from the open terrain above. The trees provide the clarity and visibility that was lacking before. We slalom our way though, ducking and weaving through low branches, creating our own lines. Out at the bottom, we hit the cat track - 6km back to the village. It has been an epic morning, well worth the early start; a 2.5 hour run of pure powder from top to bottom. We leave the lengthening lift lines and head for our favourite café. We watch the crowds in the narrow streets swell, sitting in the quiet satisfaction that only an epic run with good friends can give. This is Switzerland’s chocolate powder at its finest, and it tastes great. Mark Wild has spent seasons in Whistler and France, and once travelled to Norway’s Arctic Circle to sample the Scandinavian snow. He skis and snowboards, but prefers the two plank method. He is currently living in New Zealand.